How can engineering an airplane set the stage for a happy marriage and family life? Engineers get lots of practice balancing both separateness and togetherness in their work. Let’s explore how this skill can help meet our core needs for autonomy and a sense of belonging in work, life, and love. All of us strive throughout our lives for a sense of autonomy and to feel like we belong. As toddlers able to move around without help, we rushed away from mother to explore our world. As parents and other caregivers encouraged us to explore the world and to satisfy our own needs when we were able, we developed a sense of being able to manage on our own – autonomy. We reveled in our ability to take on our big, new world until our developing brains allowed us to realize that we are small and we need others to help us. Around two years old, our brains finally allowed us to know one of the major conflicts of life: we like doing things on our own AND we need others to help us. So what did we do? We practiced coming to terms with these opposing needs as best we could. Our parents called this stage our “terrible twos,” when nothing they did seemed to satisfy us. We wanted to be picked up (belong to mother) only to want down again (be autonomous). We wanted help, and we didn’t want help in all sorts of ways that challenged the adults around us. All of us began to figure out how to belong AND be autonomous as children, and we continue to do it throughout our lives. Can I do this on my own? Who will help me if I need it? We solve and re-solve this puzzle in everyday circumstances and at turning points in our lives. In particular, each time we face a choice that stretches our abilities or changes our relationships, we relive this dilemma. If we’ve solved this conflict for ourselves successfully enough times before, we will know ourselves well enough to be able to weigh our options and choose with confidence. Life gives each of us many chances to meet our unique needs for belonging and autonomy. A career in engineering gives one many chances to meet these needs with others in a fun, fascinating, and structured way. Engineers work in groups with others who have different expertise within the engineering profession. They all are focused on the object they are designing. Most engineering groups develop a collective identity tied to that object – the Project XYZ group – and each member feels a sense of belonging within it. Each member makes a unique contribution and is autonomous in that regard. 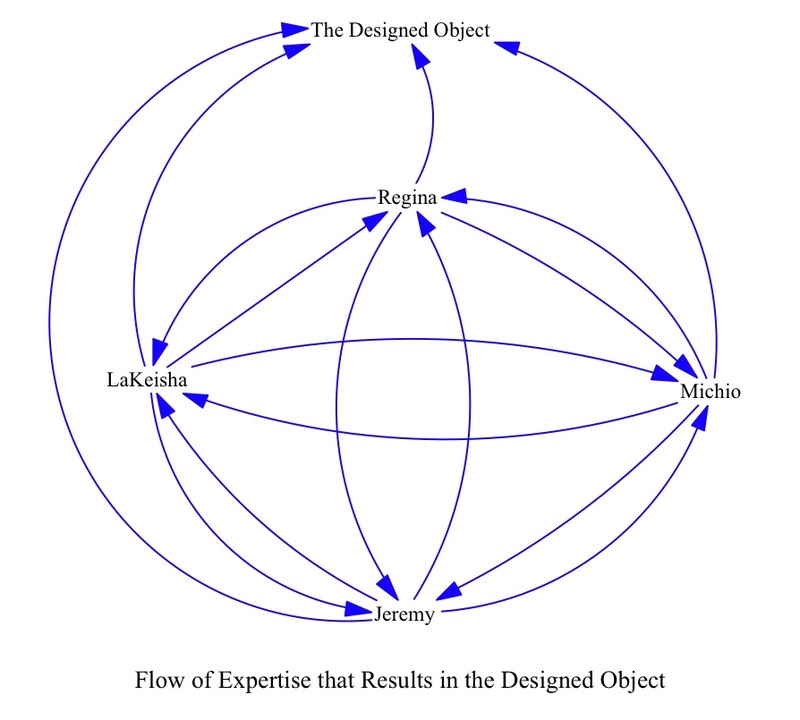 The group develops many different models of its design together. The first common model is created and agreed upon through discussion and some rough sketches. Then, the structural designers translate the initial discussions and sketches into three dimensional computer models. Each member of the team takes that model and makes a different computer model that analyzes and optimizes the design for performance features within the member’s expertise – for example, strength, thermodynamics, or aerodynamics. Along the way, each person exchanges information with every other person on the team. The group comes together again and uses the new information each team member brings to negotiate a better design. Notice in the picture below that each member talks with each other member, then adds to the designed object. They separate again to analyze the new design. This cycle of designing together, then separately, then together happens until the design does what it’s supposed to do and everyone on the team approves it. Then the group might disband and each person moves on to another project and group. So the design process incorporates autonomy and belonging. All team members must manage both of these for themselves in order to be successful in creating the designed object. And each engineer might work on many projects in her career, so she gets plenty of practice dealing with autonomy and belonging with different groups. I met my husband when we were both engineers designing an airplane. As two members of a group of engineers designing this plane, we were both fascinated by all the complex challenges involved in designing it. We were focused first on the designed object, the airplane. At the time, I was a co-op student still in engineering school, so this was my first professional experience on a project. He was assigned to be my mentor. We spent months at work together discussing and developing models and blueprints with others in our group. Not only did our group work together to solve design problems, but we socialized together, too. Our group formed a softball team and played in the company league. Our group went out for dinner after work. My future husband and I built trust and respect as we worked on that airplane together. Once I went back to engineering school and we didn’t see each other at work anymore, we began seeing each other socially. Our social relationship was easy because we already knew we collaborated well together, had temperaments that balanced each other, and held similar values. Friendship and trust grew into love, and we were married less than two years later. That was 30 years ago. Our experiences as engineers helped us build our happy, peaceful family. We learned early in our relationship how to encourage and honor our separate, autonomous selves within the warm and loving togetherness of marriage. We brought two sons into our family and helped them find their autonomy and sense of belonging both within and outside of our family. As they leave our home and make their own families, we are redefining autonomy and belonging for our growing family. All of us continue to collaborate in redesigning our lives to meet our basic human needs for autonomy and belonging. After all, it’s what we engineers (and these engineers’ children) are trained to do. Remember the three core emotional needs we all have? Love, belonging, and a sense of power over circumstances. Research also says three factors motivate people to innovate more than anything else: autonomy, mastery and purpose. Can we use school science and engineering to foster all six of these? For complex tasks that involve conceptual, creative work, Dan Pink says the research is clear about those three motivating factors. For simple, rule-based tasks the carrot-and-stick approach works just fine: you do this and you get that. (Click to see Dan’s delightful RSA animated talk and other RSA animations). How can we use this knowledge to motivate students’ STEM learning and teachers’ STEM teaching as well as meet their emotional needs? I mentioned here that the new draft of the National Science Education Standards places unprecedented emphasis on teaching K-12 students the engineering process. Some of my colleagues in K-12 science education don’t like that engineering has been added to an already full slate of science understandings that teachers must teach. Some say that students should learn engineering in the context of learning science. I say it makes more sense to teach students science in the context of engineering. I’m going to explain why through the lenses of what we know about people’s basic emotional needs and what motivates people. And I’ll show how an engineering context makes for good science teaching, too. There’s a fundamental difference between science and engineering. School science and most professional science deal with objects and phenomena that exist. School engineering and professional engineering deal with objects, phenomena or processes that do not yet exist. This is an important distinction because it places school engineering in the realm of the complex, conceptual and creative learning tasks Dan Pink mentions. Engineering is a process that results in something new, even if the process begins with something that already exists. Scientists’ creation of new science knowledge is also a complex process that requires conceptualization and creativity. The motivators for these tasks are autonomy, mastery and purpose. But school science packages existing science knowledge and the scientific method in a simpler, rule-based way: if you do X, you’ll observe Y and conclude Z. It’s the sense-making discussion after observations are made – the social learning – that leads to students’ grasp of the big ideas in science, and the big ideas are already established, too. And research shows that the sense-making discussions necessary to cement student learning don’t always happen. I think that all students need to have rich sensory experiences with natural and human-made objects and phenomena that lead to key understandings in science. All of us were taught the scientific method somewhere in our K-12 education. We learned science facts, too. We need to know these things to become scientifically literate citizens. But what’s the motivation to engage and learn when science is presented in such a simple context? To explore the idea of embedding school science in an engineering context, let’s compare the scientific method with the engineering process. Notice that the engineering process is need or problem driven and the scientific method is question driven. The scientific method fits naturally into several steps in the engineering process where questions drive one step into the next: research, selection, testing and evaluation, and redesign. For example, if my need or problem is to design a compact and attractive device for growing tomatoes all year long in a home, first I need to know how tomato plants grow. That leads to a need to know the life cycle of plants, a science unit that is taught in most elementary schools. For that same design, I’ll need to know the physical properties of the materials I want to use to help my tomato plants grow – soil, chemical nutrients (including water), containers, light sources, holding structure for plant containers. I’ll need to use my math skills to measure the growing plants, construct any containers or structure to hold containers, calculate the cost of my solution, measure light and water to the plants, and many other elements of my solution. I might use the scientific method to compare two or more preliminary solutions, growing plants each way to test their effectiveness and ease of use. I’ll have to test my final design to make sure it meets all the requirements of the problem or need. I must use my language arts skills to communicate my solution to others. I might write a report that describes my design and what it can do. I might also write marketing materials that would entice people to buy my device. The engineering context motivates a need to know many science, math social studies and language arts concepts and skills. I’m not the first person to come up with the idea of embedding science, math, language arts and social studies into real world design challenges. Lots of research exists on problem-based learning. Many teachers use this approach to engage their students. It’s a demanding way to teach because there are no predetermined answers to complex design challenges; students and teachers must be creative, adaptive and innovative. Teachers must have enough science knowledge to guide students’ design and troubleshooting processes, which means that the teacher must be able to deal with complex problems creatively. Students’ and teachers’ thinking is raised to higher levels in the school engineering process than in the typical school science process. It doesn’t make sense to embed the school engineering process into the school scientific method because the school scientific method is a rule-based tool that serves the larger, more complex and adaptive engineering purpose. But the problem based approach doesn’t lend itself to the teach-to-the-schedule-and-test-based accountability system that has all students doing the same thing at the same time to prepare them to score well on a high stakes test. In order to make the problem-based approach work, the educational paradigm must shift. The thinking-based reasons for embedding the school science process into a school engineering context are compelling. I think it’s even more compelling that the engineering context can contain all three core emotional needs and help students experience all three motivational factors, too. We’ve already shown how the problem based nature of the engineering challenge requires students to think more creatively than the typical, rule-based school scientific method. Now let’s add the social and emotional advantages to the cognitive ones. It’s possible to find meaningful engineering design challenges that give students a sense of purpose (a motivating factor) and a sense of belonging to a group (a core emotional need) that’s focused on meeting the challenge. If the group works well together and capitalizes on the talents of each member, each member can feel a sense of mastery and autonomy (motivating factors) as well as power over her contribution (a core emotional need) to the solution. The sense of being loved (a core emotional need) translates into feeling valued by peers for one’s unique talents and abilities. My elementary teacher friends might remind me that expecting such collaborative behaviors from children is asking a lot. It’s even asking a lot of many adults. That’s only because our existing school accountability culture values and tests cognitive learning as an individual activity and not a social one. Guidelines for social and emotional learning emphasize empathy and collaboration beginning in preschool, identifying more advanced empathic and collaborative behaviors as children grow. I was introduced to collaborative learning and project work in engineering school. Until then, my success in school was measured by my ability to learn on my own and show that on the kinds of tests and measures that led to my admission to a highly competitive university. My experience in engineering school was a mixture of learning on my own, learning in social groups outside of class, and learning collaboratively in small groups within a course. I earned grades for my individual work in some courses and I earned shared grades with my partners for our group work in other courses. My social learning was the most fun, though. There were very few women in my engineering program, so we formed a study group soon after meeting. We supported each other, did well as a result, and many of us remain friends to this day. Back then, we created a shared sense of purpose around mastering engineering knowledge and skills well enough to succeed on our own in industry (notice the three motivating factors). In that process, we grew to value each other’s unique contributions to the success of our group as students and as friends (notice the three core emotional needs). Professional engineers and scientists rarely work alone. I’ve written about this here. They must work with others near them in their physical workplace as well as in global, virtual workplaces created by technology. The ability to collaborate and solve problems with others is not only a core professional skill, but a core life skill as well. Each of us learns to collaborate and solve problems by engaging in relationships – through social and emotional learning. Our patterns for relating to others get established very early in life. Children need continuous practice relating to others to expand their repertoire of relationship skills. In the process, they can meet their three core emotional needs and feel motivated to win the future through STEM experiences that inspire them to innovate. Let me know what you think. What collaborative experiences did you have in school? Were the three core emotional needs (love, belonging, and a sense of power over circumstances) and the three motivating factors (autonomy, mastery, and purpose) present in your experiences? Would your school STEM experiences have been more satisfying if they had been more collaborative? Do you think that learning science, math, language arts and social studies in an engineering context can prepare our children to be the innovators of tomorrow?